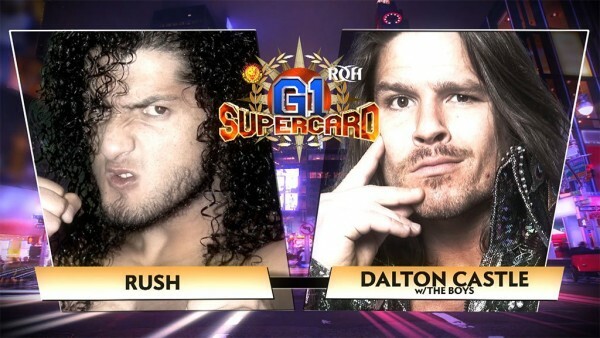 – ROH officials confirmed that RUSH vs. Dalton Castle will go down at G1 Supercard. The challenge was laid out at ROH 17th Anniversary Show this past Friday after RUSH picked up a victory over Bandido. The top stars of Ring of Honor and New Japan Pro-Wrestling converge on Madison Square Garden in New York City on April 6 for the historic G1 Supercard. Under the bright lights and on the grand stage of The Worlds Most Famous Arena, the best of the best in pro wrestling will do battle. Castle issued the challenge to RUSH at ROHs 17th Anniversary pay-per-view on March 15. The former ROH World Champion sat in on commentary during the RUSH versus Bandido match and approached RUSH in the ring after the CMLL star had defeated Bandido. I look at you and I see a challenge, Castle said. I see someone I want to smash heads with. Its no secret that RUSH and Castle have been headed in opposite directions as of late. While RUSH has been undefeated since coming to ROH at the end of 2018, Castle has yet to win a singles match in ROH in 2019. As the losses have mounted, so too has Castles frustration. A win over a competitor of RUSHs magnitude undoubtedly was be a major step in Castle getting back on track.